There’s no need to use them of course. You can (and I think should) add your own and these can be anything you choose. However, if we first have a look at what some of the benefits of hashtags are, then we may find some would be more useful than others. Humour: people do like to be funny with their hashtags sometimes and I see no reason why LinkedIn needs to be more straight-laced in this respect … though with the proviso that, as ever, you remember who you are talking to and don’t go over the top. When I add hashtags to a post, I tend to make it a mix of a couple of specific ones about the topic in question, plus a couple of generic ones that hopefully lots of people will be following (to get visibility) and, if there is space, my tracking hashtag which is TheLinkedInProfessional so I can ensure I can follow up and also create a list of them. Hashtags are not case sensitive – we are! So create hashtags in a way that the system can still read but makes them more accessible to us – your readers – as well. Write them with relevant capitals in there so that it’s easier for readers to understand at a glance – I believe it’s called ‘Sentence case’. Generally people find that #thelinkedinprofessional is less immediately visible than #TheLinkedInProfessional. Primarily in a post / update that you share from your homepage but also in the long form articles in the Publisher section. Within the text, any work can be turned into a hashtag but it will get distracting and also lead people away from your post so proceed with caution! Not all hashtags are created equal … well actually they are, but some gain a bit of a following over time. Adding in a couple of those might help your posts visibility as mentioned above so check out the list of popular ones and see if any match your needs! As a consumer of posts and updates, there are a number of ways in which we can benefit from the renewed arrival of hashtags. Primarily, it is one of the ways in which we can help to influence (even alter!) the make up of the newsfeed that we see on our homepage. Following hashtags mean that posts containing that word or phrase will be much more likely to appear higher up your page with the relevant hashtag (or hahstags) in question being indicated at the top of the post – this is particularly true on the mobile at the moment. 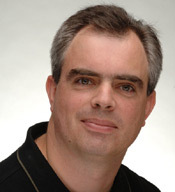 It also gives us the opportunity to follow certain topics that are of particular interest. 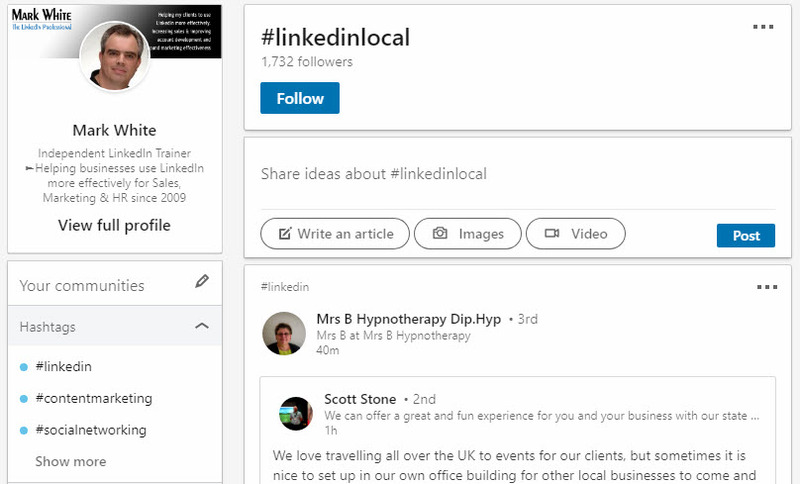 We can build up a list of these and they are displayed on the left hand side of your homepage under the banner Communities – this seems to be a developing area for LinkedIn and they look to be creating a type of dashboard for us to access the areas and information of particular interest. What you currently have there will depend on where LinkedIn is in rolling out this feature, but it looks like it will contain access to Company pages you control, Groups you belong to, Events that you have been invited to attend and hashtags for topics of interest. These could simply be areas of particular value to you or ways to identify posts where you can engage with people interested in and writing on certain topics, or content with career focus according to your preference. How to use the hashtags area of the new Communities section? 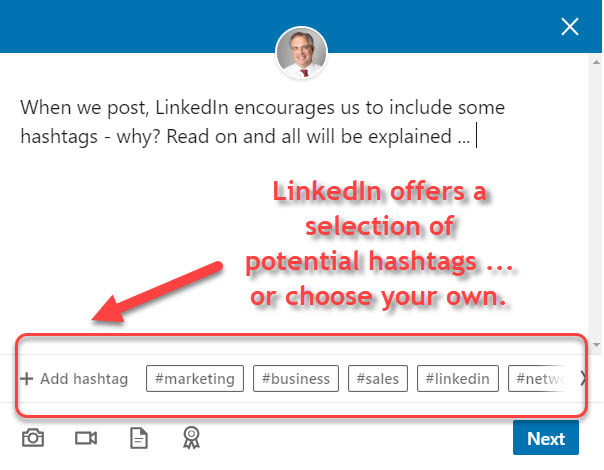 LinkedIn will probably have added some initial hashtags to your area to get things going but there is no need to stick to these or even leave them in that area. Think which topics are going to be of most interest to you and start from there but you can change them at any point. To remove the initial hashtags or ones that you add later but decide against keeping, then the easiest way is probably to click on the hashtag in your list and go to the page in question before then hitting the ‘Following’ button which will remove it from the list. Searching for hashtags will no doubt get cleaned up a bit as there are a few different elements which currently make it a little bit cumbersome in places. Nevertheless, building up a list that are relevant to you will certainly help you to follow topics more easily and will slowly allow the off putting mix that is LinkedIn’s homepage feed to become more useful all round. much like the Sales Navigator one is. 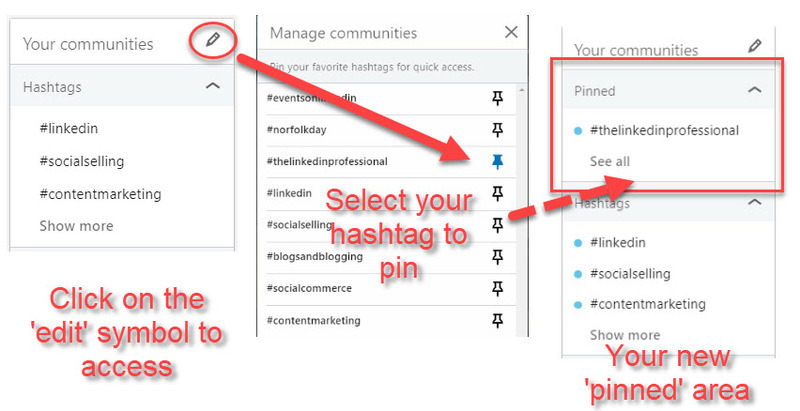 i) If you do search for a hashtag that LinkedIn recognises then all is good – as you search in the top left hand search box, then it will display the existing hashtags as a drop down menu with a new ‘#’ icon next to them – clicking on these will then take you to the relevant page where you’ll have the opportunity to follow it. ii) If no specific link appears button appears then don’t despair – proceed as you would normally do for a search and when the results appear, click on ‘Content’ to focus in on that area and you should get results containing your chosen tag. At this point you can of course just go ahead and read them (funnily enough) but if you wish to follow the hashtag and add it to your list, then in many cases there will be a nice big ‘Follow’ button at the top of the page whcih will do the job for you. If it doesn’t appear, then you will need to go into one of the posts, identify the hashtag that you have searched on in that post and click on it. This will then open up the list of posts with that hashtag again, but this time with a ‘Follow’ button at the top. Hurrah! Just choose the ones that particularly tickle your fancy … so to speak. There’s no Lists option, so to speak, but you can pin certain hashtags to the top of the list which allow you to prioritise them. Just click on the blue ‘edit’ symbol, click on your preferred hashtags and they will get their own space at the top of the page. PTN (Point to Note) – and, in case you wondered what the ‘blue dot’ next to them is, it means that there are more new posts with that hashtag waiting for you to enjoy! Things have changed over the years when it comes to using hashtags on LinkedIn but, as of September 2016, I’m pleased to say that they are making a welcome return! Hurrah! The articles below – which I have left as testament to the flow with hashtags over the years – at the bottom of this page was the initial situation when LinkedIn first introduced hashtags in 2013 – life was good and the world was full of the joys of hashtags, pushed primarily by Twitter if truth be told. LinkedIn followed suit and all was well in the online world with LinkedIn and Twitter cooperating in certain areas with some interlaced functionality when it came to updates and news. Then divorce came – almost of Brangelina proportions – and the fall out began. It’s not clear if Twitter won custody of the hashtags but certainly LinkedIn was refused viewing rights and, in stark difference to the rest of the online world, LinkedIn strode on without hashtag support. It seems though that time is indeed a big healer and last month on the LinkedIn App, hashtags once more became live and searchable again. While this new element has not yet reached the desktop version, there are major changes afoot and they look certain to make a return there as well. Hopefully we might also get the return of the site wide search which would make LinkedIn a much more integrated and navigable environment – only time will tell. I, for one, am very pleased – a return to this mainstream functionality seems sensible in my eyes and seems to reflect a more open stance from LinkedIn of late which I believe will serve them really well in the years ahead. 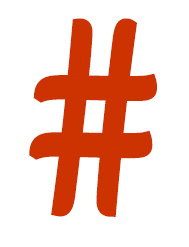 [Initial post: March 2013] When we talk about hashtags, in most people’s minds they are primarily part of the Twitter ecosystem – the ability to categorise posts and allow people to search using those terms has certainly been of major benefit to tweeters. On LinkedIn, however, they have never been a particularly strong element, even less so after LinkedIn and Twitter’s ‘divorce’ of last year. 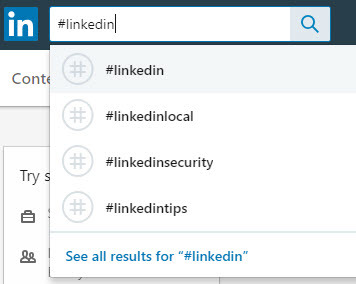 There has, however, been a little bit of a resurgence of late and LinkedIn has brought in an additional search option using hashtags that we might be wish to build into our own updates. Currently, when you see an update which contains a hashtag, it should now appear as a clickable link. When you do click on it, this will take you through to LinkedIn Signal where it will display a list of all updates containing that particular hashtag. For certain topics, this may help you to build up additional insight into who is sharing what on the site, although it is unlikely to build up a picture of what is “trending” a la Twitter, simply because the quantity of updates is (thankfully) lower and the quality (hopefully) higher! Nevertheless, creating additional touchpoints and keeping it to the role that ‘hashtags’ were initially designed to fulfil can indeed prove valuable. It is possible to search for the hashtags as well within the filtering options of Signal – if you head down to the bottom of the left hand column you’ll find one option is “Topics” which again allows you to filter by the hashtag of interest. Depending on what your initial search was, there may already be some suggested options in there already – if not it’s just a case of adding your own. 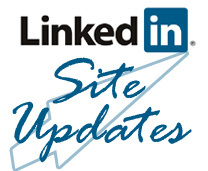 One thing to note is that in the new format that LinkedIn is in the process of introducing (Spring 2013), LinkedIn Signal is now accessible through the main search box by choosing ‘Updates’ and then carrying out the search as before. The results will be the same … just a different route to get you there. While it might not be the most visible of the elements available, it is still another additional element that we can tap into within the LinkedIn site and use to potentially promote our activity. Personally I’m not a fan of the multiple tags that people succumb to on Twitter, but I do think that there is a place for tags when used as a “topic highlighter” where we can raise the profile of certain key elements in this simple yet clear way. So, as is often my approach on LinkedIn, let’s always tap into the functions that are available to us on the site and make best use of them, even if they are not completely to your taste. The goal is to influence and attract people … if this helps, even in some small way, then it would be amiss of us not to tap into that! This entry was posted in Content Marketing, LinkedIn Marketing, LinkedIn Site Changes, LinkedIn Updates and tagged LinkedIn hashtags, LinkedIn Marketing Planning, LinkedIn Signal, Linkedin Site Changes, LinkedIn Updates. Bookmark the permalink. ← Do you want Followers or Connections on LinkedIn?